Irish Green. Perfect color choice. Since 1963, the Porsche 911 has been known as the definitive sports car for not only daily driving, but also in motorsport. It’s made its mark countless times on both the road and track. And now Porsche has just announced that the one-millionth 911 has just rolled off the production line, and it’s absolutely stunning. Painted Irish Green, it features numerous exclusive items to better associate with the original 1963 Porsche 911. Unfortunately, Porsche hasn’t divulged what those features are exactly, but what we can tell from these official images is that there’s a blended wood and leather steering wheel, silver side mirrors, and a few "One-Millionth" badges. 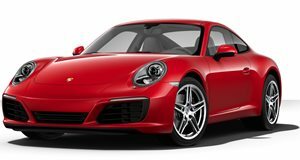 Porsche, and it certainly deserves to do so, loves to brag about the 911’s history and impact on the auto industry at large, such as the fact that over 70 percent of all 911s ever built are still ready to drive today. And like the original 911, today’s car inherits the legendary shape, rear-engine setup, and flat-six. The 911 represents a constant evolution of "refining and perfecting the sports car," stated Chairman of the Executive Board of Porsche Oliver Blume. The automaker also reminds us that "over half of (its) 30,000 race wins can be credited to the iconic car. It thrills private motor sport enthusiasts around the world in numerous racing series." Will Porsche sell the one-millionth 911? Nope. It’ll soon find a permanent home at the Porsche Museum in Stuttgart, Germany, but not before it embarks on a world tour where it’ll go on road trips in the Scottish Highlands, the Nurburgring, the US and China. It’s hard to argue with success like this.